I must apologise for my extended absence for the last few weeks. I recently got promoted at work and so have been literally swamped in admin ever since. This doesn't look likely to cam down any time soon which sadly means my hobby time is greatly restricted; as is my availability for blogging! However I try to squeeze in some painting when I get the chance so I thought I would update you with my progress. 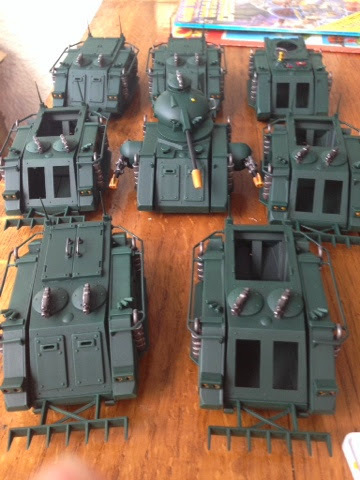 Those of you who follow my blog will know I go through phases of large scale armour production for my armies; in 2012 it was 6 Rhinos; 3 Predators; 3 Razorbacks; 1 Land Raider and a whirlwind for my Crimson Fists; in 2013 it was 5 Rhinos; 1 Immolator and an Exorcist for my Battle Sisters and so far in 2014 it has been a retro Land Raider; 2 first edition predators and a Land Speeder for my Salamanders! What we have here are six 1987 Rhinos (bringing my total up to 8); one 1989 predator (giving me a squadron of 3) and a 1992 Whirlwind. For the eagle eyed amongst you you'll notice that some of these venerable old tanks have some panels missing; that's because these will be painted yellow and so have received a separate white undercoat! !